In the five weeks that I spent exploring Malaysia, Singapore, and Borneo there were a few dishes that I just had to try whenever I had the chance. 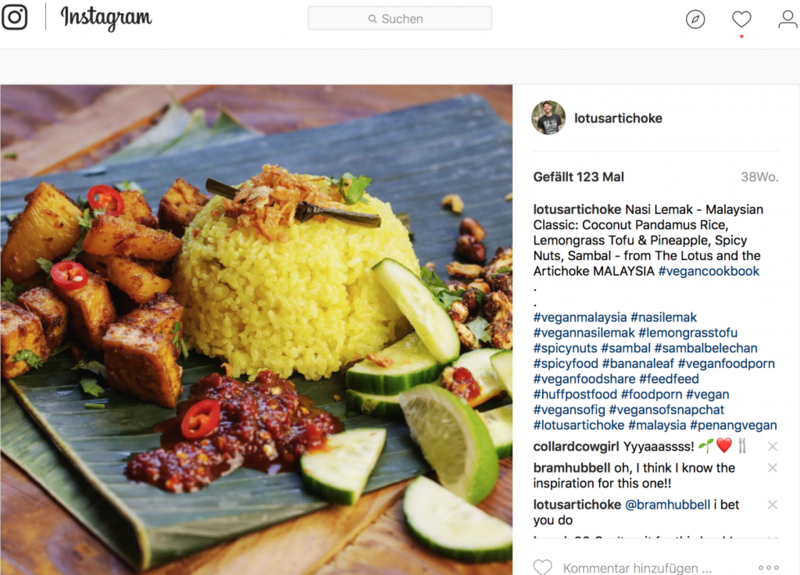 Nasi Lemak is a national favorite – and one of my favorites, too! The name technically means “fatty rice” but “creamy rice” sounds a least a little bit better. Traditionally, as with this recipe, Nasi Lemak is rice cooked in creamy, coconut milk – often along with fresh herbs and spices such as pandan (which you can replace with bay leaves if that’s what you’ve got.) The bright yellow hue comes from turmeric. Though it’s a breakfast dish, it can be eaten at any time of the day, and many variations cross firmly into Savory Culinary Territory. I eat this all times of the day: Breakfast, Lunch, Dinner, Snack, whatever! I tried Nasi Lemak in lots of places: Kuala Lampur, Penang, Malacca, and Singapore. 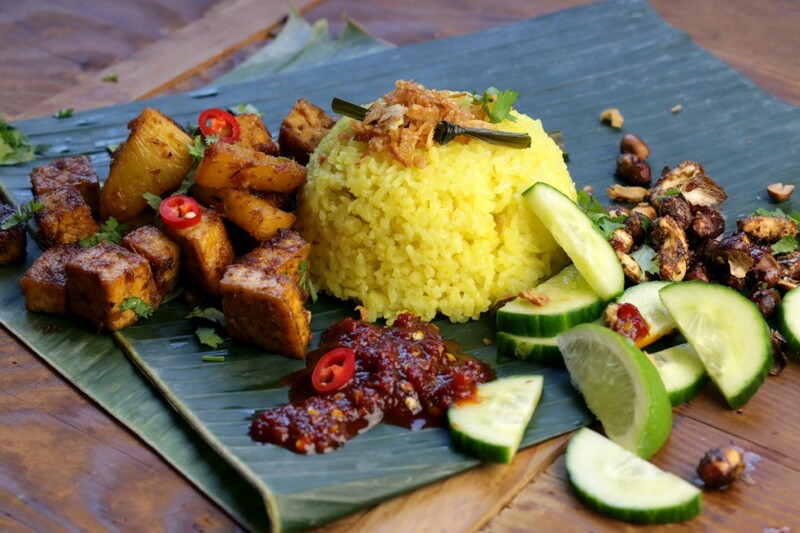 Inspired by those dishes and their accompaniments – and my own imagination, I’ve created a complete meal set: Coconut Pandan Rice served with stir-fried Lemongrass Ginger Tofu, crunchy, charred Spicy Nuts, and a delicious sweet-chili sauce known as Sambal Belacan. 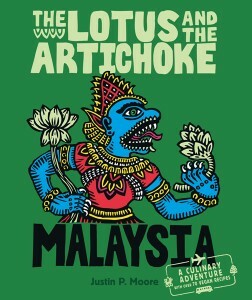 These are actually four different recipes from The Lotus and the Artichoke – MALAYSIA which I’ve put together in this one post. You can of course substitute or simplify the dishes for a less involved meal set designed how you like it. Nasi Lemak is equally awesome even when it’s just served with the fresh cucumber, lime slices, and nuts. I love going all out and doing the Lemongrass Tofu cubes, too. Also, I find the hot, spicy Samabal Belecan completes the dish fantastically. How to eat it? Mix it up and eat it with your hands! Serve this meal set up on a banana leaf, wash your hands, mix everything together, and dive in… wild and forkless. (By the way, frozen banana leaves are often available at your local Asian import grocery shop. Just thaw them, rinse them, and eat off of them.) If you prefer a more modern approach: Make it all, arrange it perfectly on plates, eat it with a fork and spoon. It’s up to you! Rinse and drain rice thoroughly. Bring water and coconut milk to low boil in a medium pot with good lid. Stir in rice, salt, turmeric, and pandan (or bay leaves). Return to simmer. Cover and steam until most liquid is absorbed, 12–15 min. Remove from heat. Stir a few times. Cover and let sit 10 min. Remove and discard leaves before serving. Garnish with fried onions, cucumber, and lime slices. Cut tofu in slabs and wrap in clean kitchen towel. Weight with a heavy cutting board and press out extra moisture, 15–20 min. Unwrap and cut in cubes or strips. Heat oil in a large frying pan or wok on medium high heat. Add chopped shallots, garlic, lemongrass, ginger, and ground coriander. Fry, stirring constantly, until shallots being to soften and brown, 2–3 min. Add tofu cubes. Mix well. Fry, stirring regularly, until tofu cubes are golden brown and crispy on the edges, 5–8 min. Add chopped pineapple, lime (or lemon) juice, soy sauce, and salt. Fry, stirring regularly, another 5–10 min. Remove from heat. Heat a medium frying pan on medium heat. Dry roast peanuts and cashews, stirring regularly, until light golden brown and dark spots begin to appear, 4–7 min. Do not burn. Add chili powder (or paprika), sugar and salt. Mix well. Continue to cook another 2–3 min, stirring constantly, until sugar has melted and nuts are well coated. Remove from heat. Allow to cool. Blend all ingredients in a small food processor or blender until smooth, adding more oil (or some water) as needed. Heat a small frying pan on medium heat. Add blended spice paste to pan and fry, stirring regularly, until sauce darkens, thickens, and oil separates, 8–12 min.